So you found the home you LOVE! Awesome! Let’s get you into that home that you LOVE! 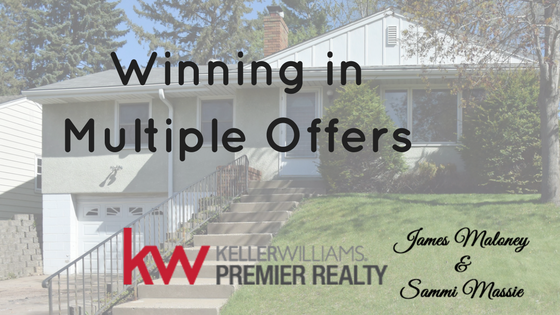 In a Seller’s Market, you will not be a stranger to multiple offers. Especially if you are a first-time home buyer in the lower ranges that there are more people to compete for the home of your dreams. So how do you make sure that you win the home of your dreams? Choose an Agent to Fight for You! So you may have already found your rock-star agent, because they helped you find your perfect home, or you may have stumbled upon your perfect home, either way make sure you are working with an agent that is representing you and not working with the listing agent only because you stumbled upon them. Now I am not saying they are not going to do an awesome job, but the listing agent’s first job is to their seller’s not to a buyer that comes to them. Having an agent dedicated to you, many times, does not cost you as a buyer anything, so why wouldn’t you get your own representation!?! Choose a Lender to Fight for You! Now this one seems odd right? So let me explain. Now when we present your offer to the sellers we will give your pre-approval letter to them as well, you want that letter to be in top form to get the job done. What will your lender do to make sure you win your perfect home? Will they reach out to the seller’s agent to educate? Not all agents are rock-stars. Will they make sure they can close on time? Everyone wants that. Did you know agents prefer working with local lenders for all of those plus many other reasons? While you may have picked out your lender, this part is just as important and many people sadly skip. You need to actually be pre-approved with an actual amount. Now I know you probably found some online calculators saying that they can pre-qualify you, that is is not what I am talking about. All that does is gives you a number based on what you input, not anything else, like credit..the important one! With all else, write the sellers a letter of why you love their house so much and why you want to make it your home. Be sincere. If you are ready to buy your next home, Contact Us today!